Cerebral banter and a regal gala mark the end of the Zee JLF 2015. Until next year…. It was the last day of the festival. We trudged along to the Diggi Palace Hotel one last time to witness some of our favourite writers come alive on stage; some by memory, and some by their speech. Quite a few big names in attendance, the six venues at the festival premises saw the likes of Ram Jethmalani, Rajdeep Sardesai, Anupama Chopra, Madhu Trehan and Shobhaa De in attendance. 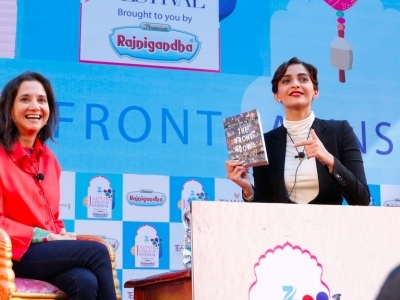 Sonam Kapoor marked her presence at the festival by launching The Front Row, Anupama Chopra’s new book. The onlookers were a bit hassled. So much to do. Such a veritable treat of sessions. We’ll tell you what we picked. By which time, poetry seemed like a reasonably good way to spend the hour and we hastened to the Poetry Hour session. The day ended with a cerebral talk on culture being the new politics. Suhel Seth had some emphatic points to make, as always, and engaged in a sort of verbal brawl with fellow panelist Shazia Ilmi. He spoke of our prolonged intolerance of art and the childishness of an exile imposed on Husain. Object, but don’t exile is what he said. We agree. The festival ended with a Writers’ Ball (yes, writers can be fancy too) at the Le Meridien hotel. Everyone dressed up in their fineries to enjoy a gregarious wine-and-dine soiree. Ethnic music, abundant food and high spirits all formed an ideal end for an all-too-enjoyable literary festival.